Cocoa solids are a mixture of many substances remaining after cocoa butter is extracted from cacao beans. When sold as an end product, it may also be called cocoa powder or cocoa. In contrast, the fatty component of chocolate is cocoa butter. Cocoa butter is 50% to 57% of the weight of cocoa beans and gives chocolate its characteristic melting properties. 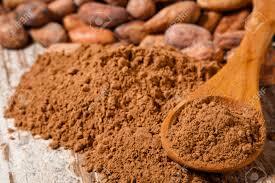 Cocoa powder contains several minerals including calcium, copper, magnesium, phosphorus, potassium, sodium and zinc. All of these minerals are found in greater quantities in cocoa powder. Country of Origin Dominican republic. Easy to make a great drink or use it in a smoothy.